Adapting a versatile base into a veritable miniature toolbox, the SwissTool CS Plus Pocket Knife from Victorinox is a stainless steel multi-tool that bundles a pliers-style pocket knife with a key wrench, bit set, removable corkscrew, and mini screwdriver. The pocket knife itself measures 4.5" when folded and incorporates a lock release, as well as kickback springs, for fast operation. 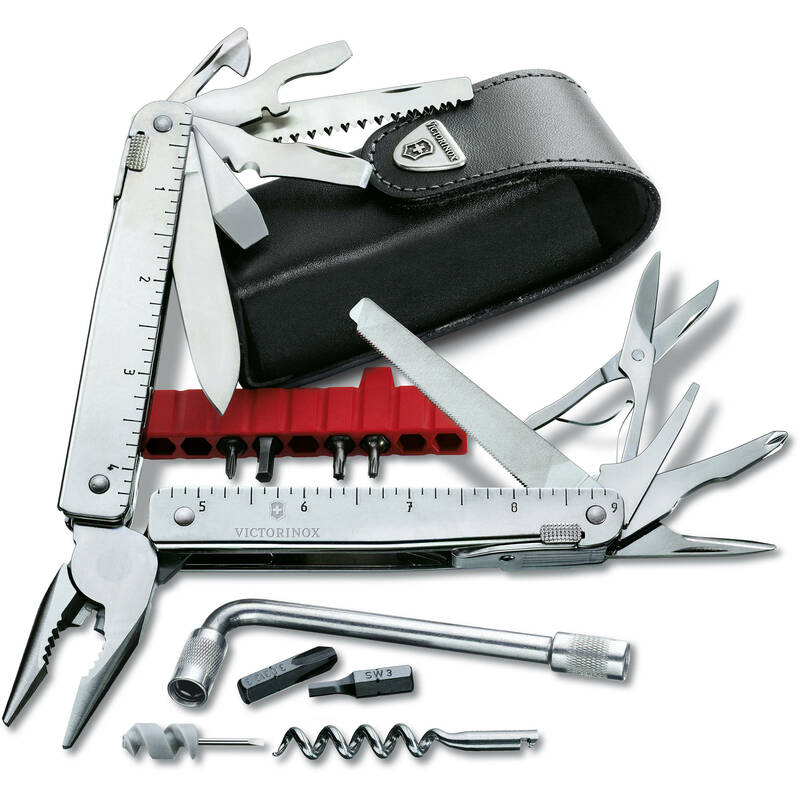 When unfolded, the pliers are available, which also incorporates various wire cutters, crimping tools, and benders, as well as a 9"-long ruler along the handle. The interior implements are accessible from the outside, without opening the pliers, and include a large blade, wood saw, scissors, belt cutter, and a variety of slotted and Phillips screwdrivers. For carrying and storing the SwissTool CS and its accessories, a deluxe leather belt pouch is also included. A removable corkscrew, mini slotted screwdriver, and key wrench are also included, along with a bit holder with various Philips, slotted, hex, and Torx bits. Box Dimensions (LxWxH) 5.25 x 2.3 x 2.0"
SwissTool CS Plus Pocket Knife is rated 5.0 out of 5 by 4. Rated 5 out of 5 by Russ from The super tool This is my 3rd one of these. It's not because they ware out, or break, it's because after giving them away as a thank you gift for some of our local crew we need this too so much in our kit we have to replace it. It is a must if you need to pack one tool in your kit. Rated 5 out of 5 by Marcelo from Excelent Victorinox is The best! Very cool!